World's largest anamorphic projection lens manufacture by ISCO Göttingen, Germany for FuturVision 360. FuturVision 360 was a 70mm five perf. 1.5 vertical anamorphic process for 15 perf. 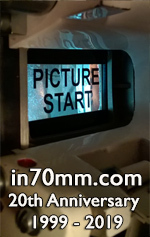 Imax aspect ratio. Exit pupal of 9 inches across and capable of using a prime lens of 60mm. The purpose of the system was for commercial theatres to exhibit Imax type aspect ratio films but without having to commit to an Imax lease etc. The FuturVision system was installed in several Loews Theatre's in New York City. A screen system was invented to facilitate all feature film aspect ratios including the very tall FuturVision. Developed and invented in the 1980's by me with the support of my engineering staff, it was the forerunner of 8 perf. and eventually digital IMAX for commercial cinema. We went to Imax and wanted to do a deal with them so that Imax films could be shown economically in select, appropriate commercial cinemas. We had a deal with UA Theatres to install the Futurvision system in several dozen locations but Imax felt that it venture would help set up a competitor to them. Bill Shaw [IMAX] came to New York to see the process at the Loew's Tower East Theatre on the upper east side of Manhatten and I went to Toronto with the Futurvision lens (not easy with the weight and customs) and met with the entire Imax board which at the time were the original partners before the company went public with new owners. 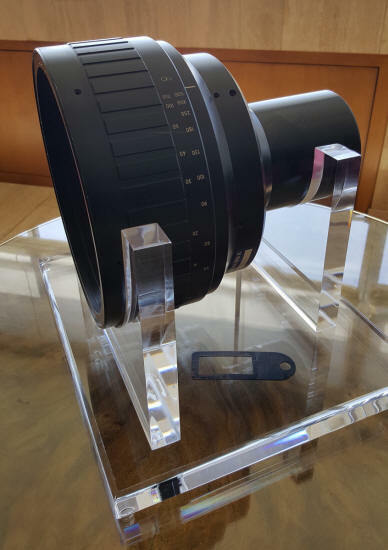 A photographic process as well, utilizing lenses By Panavision as well as optical printer lenses for reformatting Imax film titles such as "To Fly" and "The Flyer." Sound was 8 channel digital double system created just for the process. • What is "FuturVision 360"?